"Having stayed on and got the refinancing in place, Sergio thinks now would be the right moment to move on," a source close to him told the BBC. "The upcoming restructuring can then be led by someone offering a fresh start," the source added. The group of lenders that now owns Debenhams - including banks such as Barclays and US hedge funds such as Silver Point and Golden Tree - have provided the retailer with £200m in funding. The group said it had "extensive turnaround experience, which we will deploy to support the management's turnaround plan". 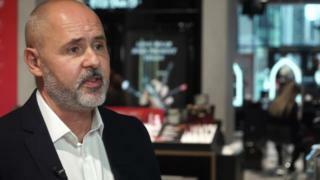 It also said it intended to "work closely with management and the board to position Debenhams for a long-term successful future". "We are pleased that now under new ownership, the business can look forward with confidence," they added. Mr Bucher had already been voted off the retailer's board after major shareholders, Mike Ashley's Sports Direct, and Landmark Group, voted against Mr Bucher's re-election in January. Sports Direct founder Mr Ashley - who held a near 30% stake in Debenhams - made several offers to take it over. Mr Ashley subsequently described the Debenhams takeover as a "national scandal" and called for the administration process to be reversed.